The purpose of this blog is not to promote events, but just this once, I’m going to break my own rule. On Saturday, March 7, I invite anyone who loves organ music, or anyone who loves classical music, to the Lutheran Church of the Covenant in Maple Heights. I promise you won’t be disappointed. 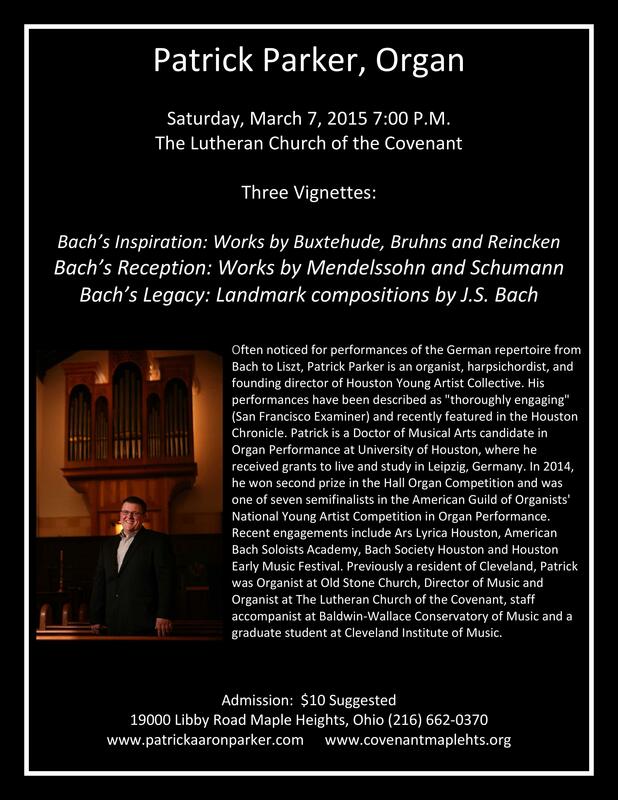 The organist, Patrick Parker, will be performing works of Johann Sebastian Bach. Following this performance, Patrick will be taking off to Leipzig, Germany, to study at the University of Leipzig for six months and be a guest student at the Mendelssohn Conservatory. For him, it is a dream come true. Leipzig, in case you didn’t know, is the home of St. Thomas Church, where Johann Sebastian Bach engraved his immortal musical reputation. 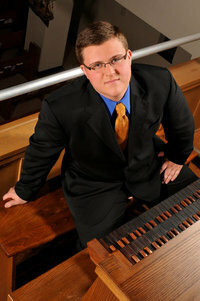 Patrick was the organist and director of music at Covenant from April of 2010 until June of 2011. He came to us as a 22-year old graduate of the University of North Carolina at Greensboro and his position at our church was a convenient way to apply his musical talent while studying at the Cleveland Institute of Music under Todd Wilson. That he is a gifted musician is an understatement. I’m not certain how much Patrick knew about Bach before coming to Cleveland. Born in a small rural town in North Carolina and growing up as a Southern Baptist, you can imagine the many adjustments Patrick had to make personally, culturally, and spiritually. It was the furthest he had been away from home, the first time away from his parents for an extended period of time, and the first time in a church denomination that exercised liturgical worship. He spent a lot of time in my office, sometimes just chatting, at other times venting, but most often, just needing a place to be. We were, after all, his home away from home. He would rehearse with an intensity bordering on the eccentric – sometimes leaving the church building as late as 2:00 a.m. Maple Heights is not Four Oaks, North Carolina. One would not be advised to be walking around at that hour of the morning in an urban area. He once forgot his keys in the organ loft after one of these marathon sessions and locked himself out of the church building and unable to get into his car. Fortunately, he had his phone and called a parishioner who lived nearby. One afternoon I was organizing things in the office adjacent to the sanctuary during one of his frenzied sessions. I heard him in constant conversation with himself, oblivious to my presence, furiously criticizing himself for not playing up to his own demanding level of expectation. I merely listened, captivated by his monologue, suppressing my repeated urge to laugh out loud at his expletive-laced, self-condemning outbursts. 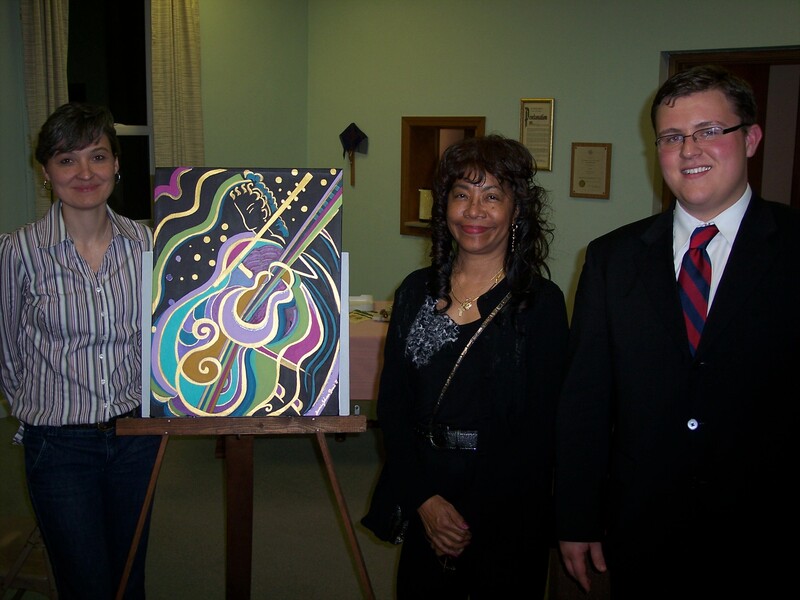 Worship & Music Chair Jen Dobush, artist Lorraine Johnson-Davis, and Patrick Parker at opening of Bach Concert and Art Gallery in 2010. But the results of his efforts were extremely fruitful. His enthusiasm was the inspiration that helped launch our musical concert series. He loved to perform. The Covenant worshippers loved him in equal measure. They lived for his postludes. More often than not, they were Bach compositions. I invariably had to wait an extended amount of time to greet people after our services because they would stand around in awe, marveling at his mini-concerts and responding with thunderous applause. I realized Patrick would not remain with us much past his graduation. He was much too talented and his ambitious dreams went far beyond remaining as a church organist. Yet I held out the unrealistic hope that somehow he would have been able to continue. Currently he is working toward a Ph. D. at the University of Houston. We had begun making preliminary arrangements for this concert before my unexpected election to the office of bishop. Patrick, true to his word, made good on his pledge to return one more time to the congregation that, in his words, shaped him. We too will be out of town, but at Covenant in spirit. What a wonderful gift to the people. It is at 7:00 p.m. If you click on the name, Johann Sebastian Bach, in the blog, it will take you to a poster with all the details. Thanks to Bishop Abraham Allende for his wonderful blog article about Patrick Parker!